Should Rupert Murdoch, who has pharmaceutical investments, be allowed to influence government decisions, which affect our children? Pro-choice activists against “No Jab No Pay” policy announce a protest to debate the discriminatory and unscientific propaganda campaign instigated by The Daily Telegraph and the smear campaign against parents who have made informed decisions not to vaccinate their children. (Sydney, Australia) On the 20th of November the third Sydney NO JAB NO PAY NO WAY rally will be held outside of the News Limited office in Surry Hills to protest against the horrific, anti-human-rights campaign against parents who make an informed healthy choice for their children by not vaccinating them. Pro-choice parents believe that this agenda has been driven largely by Mr Rupert Murdoch who has pharmaceutical investments in vaccine companies such as GlaxoSmithKline (GSK). The Daily Telegraph makes unscientific claims that unvaccinated children cause outbreaks and makes demands that children who are not vaccinated with state-mandated chemicals (which include mercury, formaldehyde, aluminum and other toxins) be denied interaction with other children. There is much scientific evidence questioning the effectiveness of vaccines. Similar evidence on the vaccine manufacturers’ own warning labels demonstrate that the vaccinated population may be responsible for spreading disease. Freedom of Choice organisers allege that pharmaceutical companies endanger more lives than healthy happy families who exercise freedom to chose healthy and proven alternatives for themselves and their children. The policy and its supporters, including The Daily Telegraph, demands that unvaccinated children be barred from all social contact with other children thereby isolating them as social outcasts. Freedoms of Choice organisers are demanding a public debate with Claire Harvey and Jane Hansen to discuss their involvement with the No Jab No Pay policy. Well informed parents who choose not to vaccinate, have been called “Baby killers and terrorists”. We are asking for a fair debate on these absurd allegations. Claire Harvey wrote “Anti-vaxers you are baby killers” (March 23 2015, The Daily Telegraph). This is an angry statement made by a woman who is paid and controlled by a very powerful man who has financial interests in pharmaceutical companies.The organisers and their followers also demand fairness and equality in the media, as there is a media blackout on freedom of choice information for vaccines. 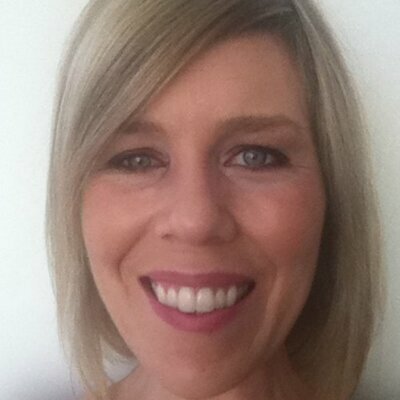 Here is a photo of Claire Harvey, She works for a company with ties to Glaxosmith Kline and has lobbied hard for the No Jab No Pay No Play to become a government policy. One must ask the question, is it Mr Rupert Murdoch’s media or the government that controls our legislation? In another report by Claire Harvey entitled: “The Sunday Telegraph has scored a massive victory in our vaccination campaign” Claire Harvey ” (April 12 2015, The Daily Telegraph), we read the following:, “Today The Sunday Telegraph has won an incredible victory in our two-year No Jab No Play vaccination campaign”. The paper seems to be run by some with questionable regard for human rights who are prepared to promote pharmaceutical child abuse. Main stream media all but admits wanting to turn unvaccinated children into anti-social monsters and psychological criminals. This is the first time in history that an Australian newspaper has directly called for the medical abuse of children and seems to be happy about doing so. We protest against the Social Services Amendment Bill 201, we speak up about our freedom of choice, we desire to highlight the influence the media has had on this policy. This policy is a punitive financial measure with no definitive scientific basis launched as a community health initiative. For some families, the changes to the exemptions will be financially devastating. The policy appears to have some connection, in part, to Mr Rupert Murdoch, whose family has strong relationships to GlaxoSmithKline (GSK). 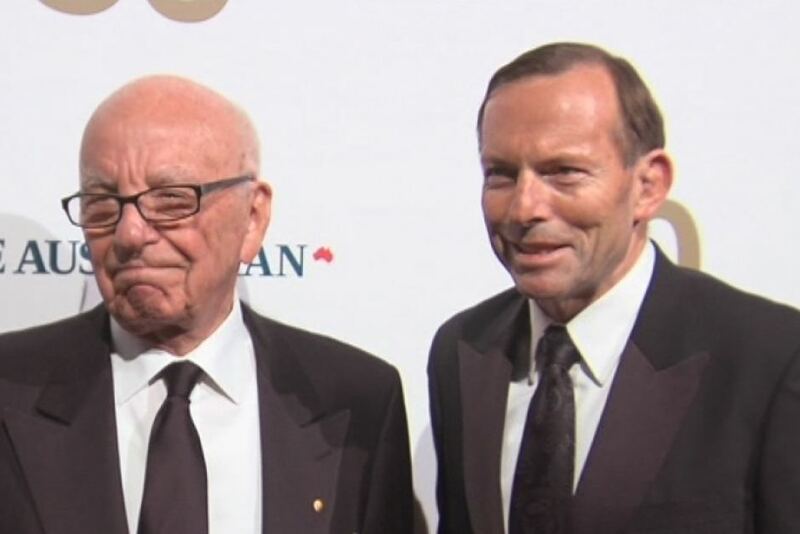 At a dinner held by the free market Institute of Public Affairs in 2013 former Prime Minister Tony Abbott had praised the efforts of Rupert Murdoch as one of the top three Australians who have most shaped the world. Rupert Murdoch’s Son James has also played a role in shaping the public perception of vaccines. 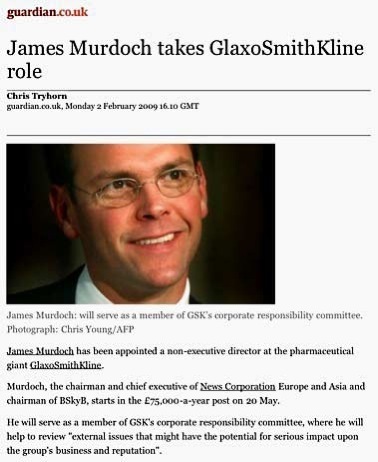 Since 2009 he has been a non-executive director at GlaxoSmithKline (GSK) sitting on the board of its ethics committee. He was apparently head-hunted by the Chairman of pharmaceutical giant GlaxoSmithKline (GSK), who held his record in corporate responsibility in high regard. It is interesting to note that within two weeks of James Murdoch’s appointment, and with the assistance of News international journalist Brian Deer, there were at least five articles published to discredit Dr Andrew Wakefield’s MMR research. Clearly the science is far from settled. There are so many unanswered questions regarding vaccine safety and efficacy. There are also questions about the role of those with the power to shape public policy and public opinion for their own interests while suppressing safety and efficacy information.Informed consent is a component of basic human rights and we can accept nothing less. Protest organiser Damien Poulsen States “This policy will unlikely raise the rates of vaccination for those who are already conscientious objectors and those who are well informed and loving parents. However it will financially cripple many already struggling low income earning families. Yet serious-crime repeat offenders, paedophiles and murderers have more of a right to a welfare system that has been created by the government in the first place and is now taking it away from those who really need it. Where there is a risk there must be a choice”. WHO: “Involuntary Medication Objectors (Anti Vaccination/Fluoride) Party (IMO)”, “Vaccination Awareness Information Service (VAIS)”, conscientious objectors, concerned parents and human rights activists who support citizens’ rights to make informed choices. WHAT: Day of action to oppose the governments “No Jab No Pay No Play” policy.